During this Season of Giving, we’d like to take an opportunity to share a little present of remembrance and appreciation for those parishioners who were involved in building our church. Our present church building is the third Catholic church built in the West Point area. The first was St. Theresa’s Catholic Church, which was dedicated in 1906. It was located in “downtown” West Point on 12th Street. This was followed by the former Our Lady of the Blessed Sacrament church building which was built in 1925 on the empty lot next to the rectory. The Church of St. John Kanty was built nearby in New Kent County, and burned in the late 1920’s after being struck by lightning; all that remains of the church today is a small, well-kept cemetery. Many people gave of their time, talents and treasure to build our present church. The roof of the main body of the church is shaped like an arrowhead, pointing toward Heaven. The statues were purchased by Mr. Karl Rudolph, the chief benefactor of the new building. He was a personal friend of the wood carvers, Oscar Lang and John Lang, who both played the part of Christ in the famous pageant at Oberammergau, Germany, where these statues were hand carved. The statue on the left as you enter the church is Saint Anthony, which was requested by Mr. Rudolph. St.Anthony is known for his many miracles and for having received into his arms Our Blessed Lord under the guise of a Little Child. Our bell, which calls us to worship, tolls for our dead, and peals with joy at our weddings, holds a special place in our church’s history. Joseph and Hannah Seckora, a farm couple with seven children, saw the need for a bell and sold produce from their farm to buy a used bell for $50 in 1927 from a Mr. Pilcher, who had the used bell stored in a shed. Their children are scattered today; but many of them settled in the West Point area. Frank and Rose Seckora were the parents of Francis, David and Patsy Seckora, and Elsie Drexler, all present members of our parish. Elsie remembers how her parents sold potatoes, grain and wood to raise the $50, which was a huge sum of money in those days. Although the bell wasn’t new, it was beautiful to the little congregation who must have seen it as a symbol of what faith and perseverance can accomplish. Frank Seckora, along with his sons Francis and David, mended, polished and replaced worn parts on the bronze bell in 1987. Under the direction of Father van den Boogaard, approximately 30 people (mostly Catholic, but some non-Catholic) were involved in the delicate process of fashioning the stained glass windows. Working three or four evenings a week, the installation took approximately eight months. Each window has six panels. The lead strips were made by the workers, as well as the kiln in which the windows were baked. 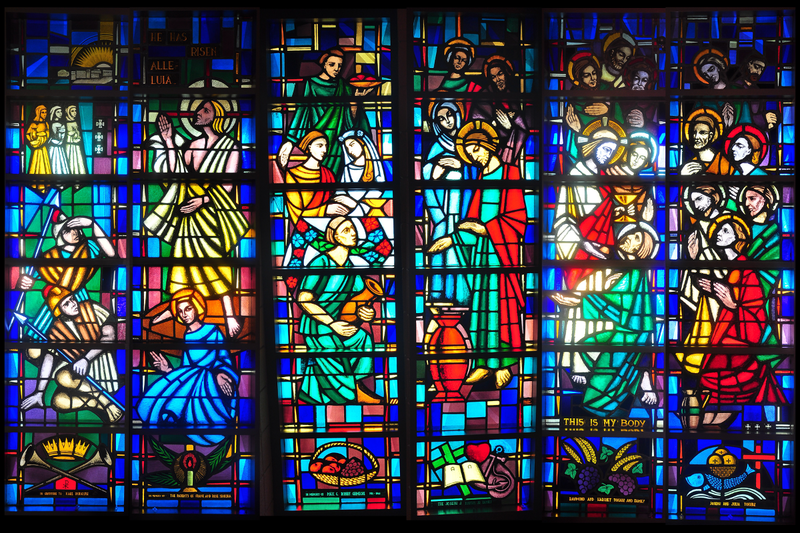 Under close observation, you will notice the names of the individuals baked into the glass throughout the 12 windows, each of which represents an event of the New Testament. Take the time to look around the church and appreciate the simple grandeur of what was accomplished almost 40 years ago by the dedicated parishioners of OLBS. Our Lady of the Blessed Sacrament Church (OLBS) is located in the small town of West Point (population approximately 3,200) midway between Richmond and Williamsburg on approximately ten acres north of the town limits. West Point’s major industry is WestRock Paper Mill, the town’s largest taxpayer and employer – 650 employees who live and work in West Point. The parish totals 220 families (approximately 525 individuals). Although located within the town, many of the families attend from the surrounding counties (72 families, or 32% of the parish). There are families of Polish descent who settled here in the early 1900’s for the ship building and paper making trade. There are Vietnamese families who arrived in West Point at the end of the Vietnam War, many of whom were sponsored and housed by the Parish. The parish was shepherded by Father Jakubowski for over 40 years. Originally there were two Catholic churches: one in downtown West Point and the other church for Polish families in the adjoining community. Construction of the current church was completed in 1968. The church was designed by then pastor Father Henry van den Boogaard, Missionaries of the Holy Family order. Much of the work on the church was done by parishioners, including the stained glass windows, a high point of the construction. The parish oversees two Catholic cemeteries, the parish cemetery adjoining the town’s cemetery and St. John Kanti cemetery, a Polish cemetery adjacent to a former church site in New Kent County. The parish is closest of any other parish in proximity (about 5 miles) to the Poor Clares monastery in New Kent County. OLBS’s pastor is often called upon to be the celebrant for daily masses at the monastery. In 2002, under the guidance of current pastor, Fr. Edward Moran, the parish undertook a major renovation of the parish hall interior, updated rectory heating/cooling systems, completed reroofing of church portico, and is planning to complete the exterior of the building with Phase II. Distinctive hospitality – a sense of family/fellowship where the small parish size makes for intimate accountability in the faith and to one another. Technologically updated – parish web site, computers and new networking. An architecturally-distinct church designed and built by Fr. Henry van den Boogaard. Mercy Center which houses the parish offices, preschool, and “Good Neighbor Center” – an ecumenical effort to assist those in need of emergency food, shelter, or clothing. Preschool – a self-sustaining program for 3 and 4 year olds to prepare them for kindergarten, as well as having a real synergy with the parish regarding faith teachings. A large parish hall and one of the largest rental facilities in the area. The Fr. Van den Boogaard Hall includes the religious education classrooms as well as an upstairs apartment that is rented out as supplemental income. Prior to the establishment of Our Lady of the Blessed Sacrament Parish in 1918, a few Catholic families residing in the West Point area were privileged to attend Mass only once a month. These services were conducted in the residence of Charles T. and Agnes O’C. Pumphrey by a priest who commuted from Richmond. In March, 1906, several prominent Catholic men, Mr. James B. O’Connor, Colonel William Burleigh and Captain Frank Rogers, realizing the need for a permanent church, combined their resources and with the aid of Bishop Augustine Van de Vyver, constructed St.Theresa’s Church on 13th Street. This church was a Mission of St. Patrick’s Church in Richmond, and remained as part of the later established parish until its closing in 1960. With the growth of industry in West Point came the influx of many Catholic families, and the need for the establishment of a Parish was finally realized in August, 1918. The original frame building at a site in the Port Richmond area was constructed in 1925. The first priest assigned as Pastor of the newly organized parish was the Rev. Ceslaus Jakubowski. Prior to his appointment, “Father Jack”, as he was widely known, had served two summers here ministering to the Catholics while still a seminarian. He had attended the College of Notre Dame, graduating in 1912. Upon his graduation from St. Cyril Methodius, Orchard Lake, Michigan, 1918, he had served an indoctrination period at St. Patrick’s in Richmond before his assignment at Our Lady of the Blessed Sacrament. “Father Jack” had the zeal of a true apostle and projected himself heart and soul into the work of developing a flourishing congregation. His energy was boundless, his religion was one of love and joy. He labored ardently and served well his parish and the community for forty years until his death July 20, 1961. In 1931 the needs of the Catholic children were recognized, and a Parochial School and Convent were constructed. The Sisters of Mercy, of Baltimore Diocese, staffed the student body of approximately ninety students annually until June, 1968, when the closing of the school was made necessary because of the lack of teaching sisters. Several priests who have served in the progress of the parish are: the Rev. Adolph Snella, the Rev. Julius Cilinski, the Rev. James L. Rizer, the Rev. Longmire Speight, the Rev. John Riordan, the Rev. Austin Ryder, and the Rev. Leonard Kronkowski. Father Baran, at the time of “Father Jack’s” death, was appointed Administrator and then Pastor. It was a cherished thought of Father Baran to erect a larger and better equipped church. A new rectory was needed, and through his efforts a building fund of approximately $20,000 was raised toward that end. In 1965, the Rev. Henry van den Boogaard, M.S.F., was assigned as Pastor by Bishop John J. Russell. Upon his arrival, Father Boogaard realized that the most pressing need was a new rectory. Immediate plans were made, and with the able and enthusiastic assistance of the many skilled and talented parishioners, the new rectory was soon completed. It was dedicated in August, 1965. Construction was begun on the new church in November, 1967. Today, November 17, 1968, we are dedicating our church. The occasion also commemorates the 50th anniversary of the parish. The entire community has been inspired by the enthusiasm of our own parishioners; and many, not of our Church, have not only devoted many hours of labor but have also generously donated funds toward its completion. Presently there are approximately 215 families residing within the parish boundaries (236 as of March 2005), including the third generation of many of the original families. We of Our Lady of the Blessed Sacrament can look with loving pride on the planning, the inspiration and the endless hours spent by our Pastor in the erection of this handsome edifice, in which all of us can offer our praise and thanks to Almighty God for His Special Blessing upon the Rev. Henry van den Boogaard and his spiritual work in our Parish.